Published: Aug. 14, 2018 at 04:34 p.m. Updated: Aug. 29, 2018 at 05:45 p.m. When I hear the word "tiers," I don't think about fantasy football ... I think about the old '80s Kiss song ""Tears" are Falling. It wasn't even the makeup Kiss, either, it was the hair band version with all the pastel colors. Alright, I get it. Wrong word ... it's "tier" not "tear," but whatever. Anyways let's get back to 2018, and lots of fantasy fans are using tiers to determine the value of their players. Ultimately, tiers sort players based on their projected level of production and ADP (average draft position). Using tiers assists fantasy owners in knowing where there's a potential decline in value among a position group, thus allowing owners to make a more educated decision on whether or not to draft a position based on who's been picked and who's still on the board. Tiers are useful for all sorts of fantasy drafts, and you can adjust them as needed to suit your league and scoring system. Notes: No surprises here, at least in the top three quarterbacks. I included Watson based on his ridiculous ceiling. In six starts as a rookie, he averaged over 27 fantasy points per game. Is that sustainable for a full season? Probably not, but even a seven to eight point decline in his point-per-game average still puts him right in the same neighborhood as Rodgers, Brady and Wilson. Notes: Newton's stock has been up and down over the last four seasons, as he finished QB13, QB1, QB17 and QB2. When you consider his career resume, however, there's an argument to be made that he should be at the bottom of the first tier. ... Wentz averaged 21.7 fantasy points per game last season before a torn ACL cost him his final three starts. Had he not been injured, he would have projected to finish second in fantasy points behind Wilson. Questions about whether or not he'll be back in time for Week 1 will keep him from moving up a tier, at least at this point, but Wentz has shown he can be an elite quarterback. Notes: Cousins has been a top-10 fantasy quarterback in each of the last three seasons, including one top-five finish (2016). In Minnesota, he could push into the second tier with Stefon Diggs, Adam Thielen, and Kyle Rudolph in the pass attack. ... Over the last three seasons, Stafford has finished in the top seven among quarterbacks twice. Brees, once an elite first-tier quarterback, is coming off his worst fantasy season since 2007 when he finished with 28 touchdowns and 18 interceptions. At 39, I don't see him moving back to an elite level. ... Luck, who has finished in the top four in fantasy points in three of his last four full seasons, could move into the second tier with a few more positive preseason starts. ... In his five starts for the Niners, Jimmy G ranked 10th in fantasy points among quarterbacks. He's a prime breakout candidate and could be a bargain based on his current ADP. Notes: Goff ranked 12th in fantasy points among quarterbacks a season ago, but did he hit his ceiling in an offense that will lean on Todd Gurley and the run? To me, he's a 'tweener at tiers three and four. ... Mahomes has a high ceiling with his big arm and big weapons as the new head man in Kansas City, but his lack of experience at the pro level limits his overall value a bit. ... Smith is coming off his best fantasy season ever, and he's in a good spot to succeed. Admittedly, I might have him ranked a little too low but there's time for an adjustment if he looks good in the preseason. ... Prescott's stock has fallen after the loss of Dez Bryant and Jason Witten. ... Mariota was a favorite breakout candidate of mine last season (doh! ), but I might have been one season too soon. I wouldn't be surprised if he jumped up a few tiers once things are all said and done with the 2018 NFL season. Notes: These quarterbacks are either going to be late-round fliers or not drafted at all. ... Trubisky has some sleeper appeal, but his current ADP (163.41) doesn't move the needle for me. ... Winston would be listed two tiers higher if it weren't for his three-game suspension. What that said, he's going to be a very popular add off the waiver wire once he's eligible to return to the gridiron. Notes: This group of quarterbacks is very unlikely to be drafted in traditional 10-team, 15-round leagues, but a few of the top options could come off the board late in deeper formats. ... Manning, Taylor and Tannehill could be useful options when the matchups are favorable. ... Darnold, Rosen and Allen should see starts as rookies, but none of the trio are worth a look in most re-drafts. 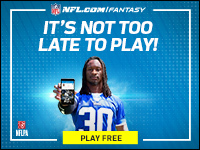 Michael Fabiano is an award-winning fantasy football analyst on NFL.com and NFL Network and a member of the Fantasy Sports Writers Association (FSWA) Hall of Fame. You can follow Michael on Twitter, Facebook, YouTube and Instagram for all of the latest fantasy news, notes and analysis!